May 3, 2000 -- Imagine going on summer vacation to a resort where the sun never sets, the temperature never rises above -10 C, and all the sun worshipers are short, well-insulated waterfowl. It may not sound like a dream vacation, but to Richard Hoover, an astrobiologist at NASA's Marshall Space Flight Center, it was just what the doctor ordered. In January 2000, Hoover joined an eight-member team of explorers on an expedition to search for exotic microbes in one of the harshest environments on our planet - the frozen, windswept continent of Antarctica. It was all part of Hoover's continuing research to find hardy microorganisms on Earth that could be similar to life forms that might exist in places like Martian permafrost and beneath the ice of Jupiter's moon Europa. The 18 day expedition, conducted near the middle of Antarctica's summer when the sun was above the horizon 24 hours a day, allowed Hoover and his colleagues to collect a treasure trove of microbial and meteoritic samples for analysis at the Marshall Space Flight Center. "This research expedition called Antarctica 2000 was sponsored by the Planetary Studies Foundation in Chicago", said Hoover "and it included a search for meteorites as well as the search for microorganisms that inhabit the snow, ice and frozen rocks." The Antarctica 2000 team included Planetary Studies Foundation president Paul Sipiera, Apollo 13 mission commander Jim Lovell, and astronaut Owen Garriott. Other members of the Expedition were Dave Butts, Jim Pritzker, Bill Gruber and Fox News journalist Amanda Onion and photographer Adam Petlin. Sharon Hooper, a Chicago area junior high school science teacher, beamed expedition reports and data back to her students in Rolling Meadows, IL. thanks to Hoover's experience with cold-loving extremophiles, the expedition knew just where to look. But first they had to get there. The group took off on January 5th, 2000 from Punta Arenas, Chile on a 7-hour flight to the team's base station at Patriot Hills on the Antarctic continent. The first attempt at landing there was aborted due to low clouds, high winds and white-out conditions from blowing snow. This forced the aircraft to turn back to Chile just before landing-and former astronaut Jim Lovell took some good-natured teasing about uncompleted missions during the return trip. Finally, on January 9, clearing weather permitted a successful flight. They landed on a slick wind-swept blue ice runway at Patriot Hills, Antarctica, and the team settled in for two days of ice core sampling and collecting melt-water specimens from small kettle ponds on local hilltops and from water in bubbles trapped in the glacial ice. Although they arrived in Antarctica during the continent's mildest season - austral summer - the scientists had to endure extreme conditions by normal workaday standards. "Summer or not, it was a harsh work environment," says Hoover. "Outdoor work temperatures at Patriot Station ranged from -30 oC (-17 oF) to -10oC (14oF), and even the interiors of the expedition's tents hovered at about -10oC. One member of the team, Skylab astronaut Owen Garriott, suffered frostbite of his toes while searching for meteorites on the ice fields." On January 11th, the team flew a ski-equipped DC-3 aircraft to the blue ice fields near the Moulton Escarpment in the Thiel Mountains, less than 300 miles from the South Pole. There they struggled to set up a tent camp at an altitude of almost 8,000 ft. with temperatures ranging from -10oC to -35oC. Despite wind gusts up to 60 mph that drove wind chill factors to -80oC, they succeeded in setting up camp. "We searched for meteorites five to six hours a day for three days." Hoover related. "The strong Katabatic winds are hard to work in, but they were an advantage for our research because they sweep the ice clear of snow and reduce the ice depth through evaporation and sublimation. Meteorites actually sit on the surface or are just below it." The team collected 20 meteorites ranging from small marble-sized specimens to a large 2 kg. sample. Hoover said, "None of the meteorites were touched by human hands in order to avoid contamination and some were recovered partially encased in ice." "The microbial extremophiles in the Arctic and Antarctic glaciers and permafrost represent analogues for microbes that may someday be found in the permafrost or ice caps of Mars or on other icy bodies of the solar system," Hoover explains. "Ancient microbes can remain viable through cryopreservation, becoming dormant and then resuming metabolic activity upon thawing after being frozen in glacial ice or permafrost for thousands to millions of years. These ancient cryopreserved microbiota may hold clues to the origin and evolution of life on Earth and the distribution of life in the cosmos." On January 16th, the team flew to South Pole Station to visit U.S personnel stationed there and to gather more samples. "We at the South Pole stayed for three days" Hoover said, "and we received a very warm welcome in large part thanks to the presence of astronauts Owen Garriott and Jim Lovell on the team, who gave interesting lectures at the Amundsen-Scott Station. Jim Lovell's stories of Apollo 13 and other space flights were especially welcomed. 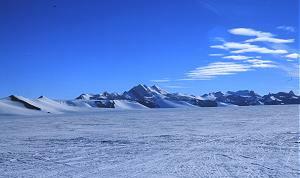 The South Pole was a much different environment than the glacier ice and rocks we had been examining, with deep snow covering the whole area. We took snow samples from outside the station to study as part of our research." 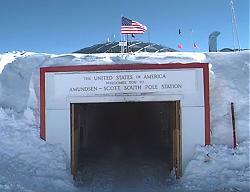 Left: the snowy entrance to Amundsen-Scott Station at the South Pole. Leaving the South Pole on Jan 18th, the expedition returned to Patriot Hills for another week of microbe and meteorite hunting. While they were there, Hoover reports that the team was able to gather some very special samples of ice bubbles. "These are bubbles in solid ice, sometimes in strings like a diver's air bubbles," he says, "and in the summer, when the sun shines continuously a liquid films form on the inside of the bubbles forming micro-edens where microbes can grow." They also gathered dark rocks trapped in the ice. These harbor 'cryoconite communities'. 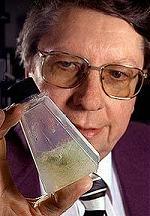 Hoover noted that "cryoconite ecosystems in polar glacial ice are very exciting. 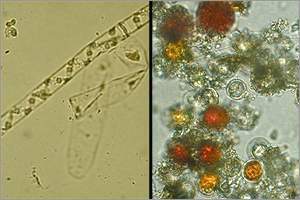 They afford clues to the types of microbes that might be able to survive in water pockets that might exist on Mars or on other solar system bodies." The Antarctica 2000 team, along with their precious cargo of meteorites and microbe samples, left the Patriot Hills on Jan. 27th, returning to Chile and then on home to the U.S. Stay tuned to Science@NASA for news and updates as Hoover and colleagues analyze their samples and discover the wonders that may lie within. Parents and Educators: Please visit Thursday's Classroom for lesson plans and activities related to this story. The Antarctica 2000 expedition was funded through a generous grant from the Planetary Studies Foundation.